In May, Bryce and I went down to Adelaide to visit my family. While we were there, my grandparents introduced us to a delicious snack that they get from their wonderful local Italian shop: smoked almonds. At first thought you may not think there is much difference but once you try one... They melt in your mouth and are seriously addicting. Short of being able to buy enough to keep a constant stash in my cupboard, I set about making my own version. Without a smoker on board Aquabat, I turned to liquid smoke. This is another ingredient that I have had a hard time finding in Australia but in the US it’s very easy to get. I have no idea about the rest of the world. I found some at a spice market in Brisbane a long time ago but they have since closed. Thankfully, my wonderful mother sent me a bunch of goodies, including some liquid smoke (not just one flavor but two - I am spoiled!). If you can find it, you should be set for awhile as a tiny bit goes a long way. If you have the oven space (more than is generally available on a boat) you may wish to double or triple the recipe as they will be gone before you know it. I'm looking forward to experimenting with lots of different flavours! 1. Whisk Olive Oil and LIquid smoke together with a fork. 2. 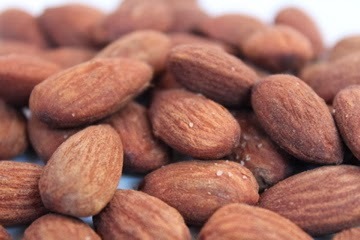 Pour over almonds in a sealable container and shake to ensure almonds are throughly coated..
3. Add salt and toss through. 4. Preheat oven to 300 F. Let almonds sit for 15 min. 5. Bake for about 40 min, occasionally stirring. 6. Let cool and store in an airtight container.